What is an Oklahoma Month to Month Lease Agreement? Oklahoma Month to Month Lease Agreement: What Is It? An Oklahoma month to month agreement is a legally binding document that allows a landlord to lease an apartment to a tenant on a month to month basis rather than forcing them to commit to a yearlong lease. Although a month to month agreement only covers a lease of an apartment for one month, the lease renews at the beginning of each month indefinitely until either the landlord or the tenant terminates it. 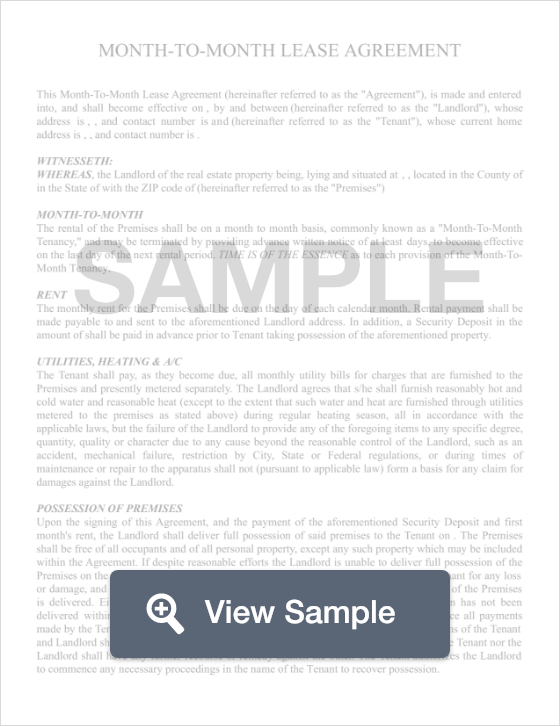 Month to month agreements are formatted very similar to year-long leases. They contain much of the same type of information that one would find in a long term lease such as rent amount, due date, late fees, rules of occupancy, parking provisions, and etc. When the landlord or the tenant is ready to terminate the lease, whether its been one month or many years, a termination letter must be written and given to the other party. Also known as a notice to quit, this letter must be submitted at least 30 days before the termination is set to take effect. In Oklahoma, as long as the rent is paid and current, the tenant or landlord must submit a termination letter at least 30 days before the termination is set to take effect. It is important to note that the termination countdown begins on the day that the notice is served to the opposite party.